5 bedroom's 4 bath sleeps 11 Adults or 12 with 2 children, King bed in master, Bunk beds and single in Bed 2, Queen Bed in Bed 3, Queen Bed in Bed 4 and Queen Bed in Bed 5..
Just Minutes from Lake in fantastic neighborhood! Nicely furnished Unit 1017 3 Bedroom/ - SLEEP 6 - 8 Spacious 3 Bedroom/2 Bath with a King size bed in MB and Queen in second bedroom. For those extra guests we have sleeper sofa in the 3rd bedroom. Large 20 x 20 Balcony. Completely furnished and tastefully decorated. 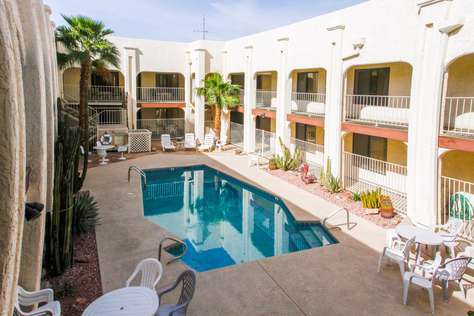 Amenities include: Heated pool, Spa, grill, air conditioning , full kitchen, washer, dryer, linens provided, cookware/utensils, Free Wifi. Garage connected to Condo. Boat Parking limited . Enjoy! 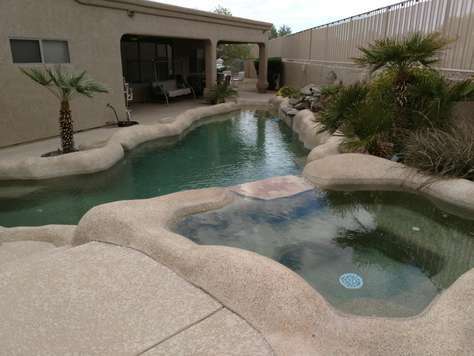 This Large pool and Spa and Newly decorated 3 Bedroom home. Master Bedroom has a King Bed, Guest #1 Queen Beds , Guest #2 Queen and Full sleeper. Sleeps 8. Shaded Patio with nice 6 chair patio set and BBQ. 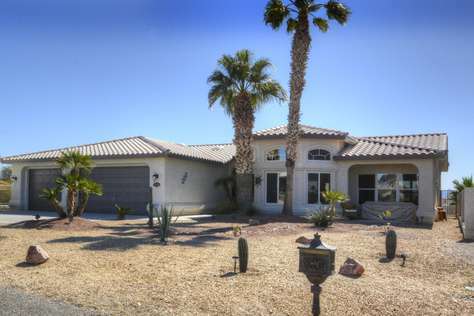 This home is located less than 1 miles from beautiful Lake Havasu with 60 miles of shore line! Lovely interior, great outdoors and RV garage. Master Bedroom has a King Bed, Guest #1 Queen Bed, Guest #2 Queen Sleeps 8. Large Shaded Patio with nice 2 table and chair sets 6 Brand new propane BBQ. ADDITIONAL CHARGES APPLY TO HEAT POOL! Wonderful south side neighborhood. Built in 2001 , tile roof. 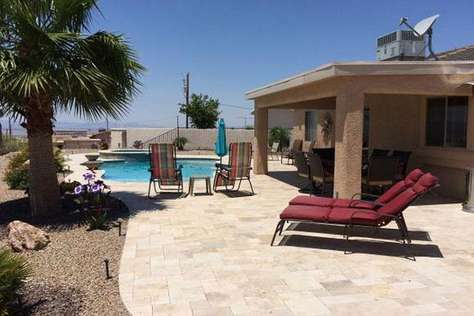 3 Br, 2 baths with indoor laundry room.Pool heater works if outdoor temp is above approx 63 degrees. Open split bedroom floor plan with vaulted ceilings and banded pot shelves. Tile flooring throughout! Open rear kitchen with raised eating bar. 2 car garage with 28' boat deep bay. Lots of side parking for your toys. Near shopping and resteraunts. Available for Winter October to March. Nicely furnished SLEEP 6 - 8 Spacious 3 Bedroom/2 Bath with a King size bed in MB and Queen in second bedroom, thrid bedroom has full bed. For those extra guests. Completely furnished and tastefully decorated. 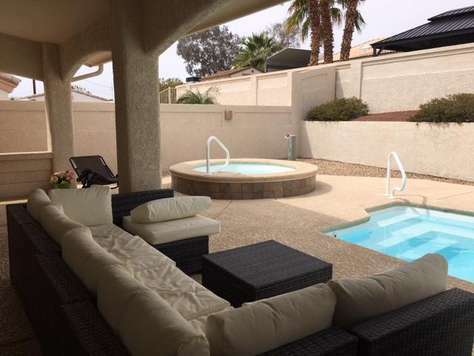 Amenities include: pool, Spa, grill, air conditioning , full kitchen, washer, dryer, linens provided, cookware/utensils, deep 2 car Garage.Prices and Availability - subject to change. AZ TAxes will be applied to all rentals 29 days or less. Home is non-smoking. 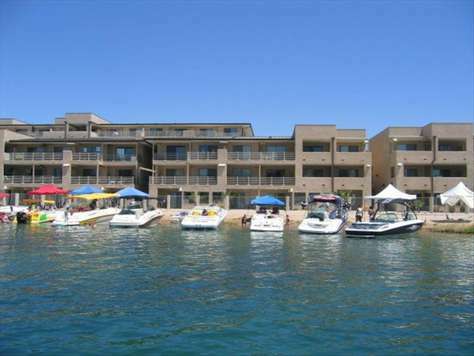 WWW.golakehavasu.com for all our city's events.Enjoy beautiful Lake Havasu with 60 miles of shore line! Enjoy! 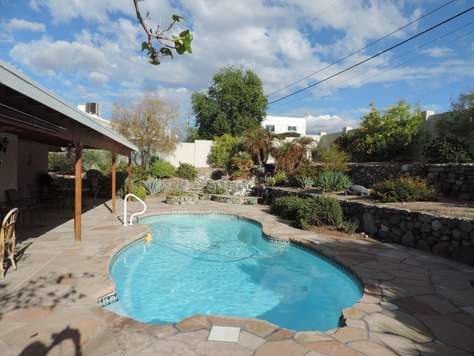 This Large heated pool and upscale décor and paint in this 4 Bedroom home. 4 Bedroom home, with King Bed, 3 Queen Beds , 2 Double Beds Sleeps 12. Only a ½ Block Walk to Realtor Park. 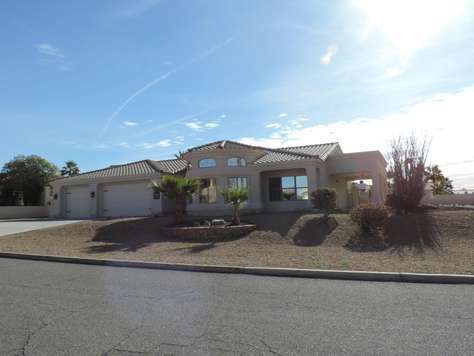 This home is located less than 5 miles from beautiful Lake Havasu with 60 miles of shore line! Beautiful lake view property located south central area - so easy to launch - with an amazing outdoor area..Heated Pool/Spa and lots of shade during those hotter outdoor days. (3) bedrooms with a 4th set up for gaming or sleeping with (2) futons. Pool Table just off the 4th bedroom/game room, all stainless steel kitchen - it's the outdoor area that will WOW you. So, pack up the gang and Come, Stay and Play at Rover! Lake Havasu offers some of the best cruising in the southwestern U.S., centrally located along 60 continuous miles of lake and river waterways from where the Colorado River meets Parker Dam all the way to Needles, Calif. More than 400 miles of stunning coastline offer exceptional water sports, including fishing, skiing, kayaking and house boating, or you can explore the lake from the beautiful beaches, campsites and hiking trails. Got a Big Group coming to the Lake? Well, this is the house for you! This very spacious property has so much to offer. 4 Smart TV’s with Suddenlink Hi Speed Wifi Internet, additionally TV station service is antenna with Netflix, USB sockets for charging, a coffee station, a TV/Game room for the kids, 3 full bathrooms AND a HUGE backyard with heated pool. Fire pit conversation area and several umbrella's position around yard for your use. Covered patio is shaded from the sun during the summer months with plenty of seating. 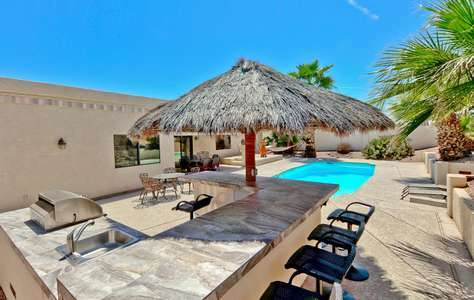 Belly up to the umbrella table in pool and enjoy those majestic sunsets we all love so. Need Toy parking? Well, the very long RV side parking can fit just about anything. "Until confirmed, prices and availability subject to change. AZ taxes will be applied to all rentals 29 days or less. Home is non-smoking." Come, Stay and Play at Thistle Dr. Perfect setting for outdoor enjoyment. 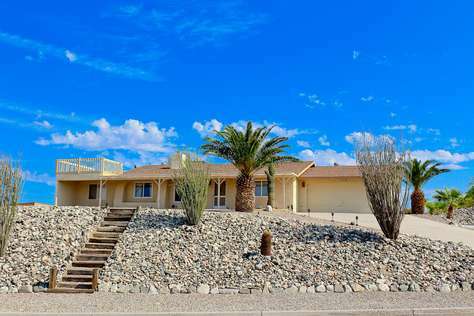 This comfortable, newer home beckons you to relax, unplug and indulge in a picturesque backyard with pool, spa, water feature and beautiful lake and mountain views. Large covered patio seats 6 with more sitting areas around the pool. TV's in Grand and Master with wireless internet. "Until confirmed, prices & availability are subject to change. 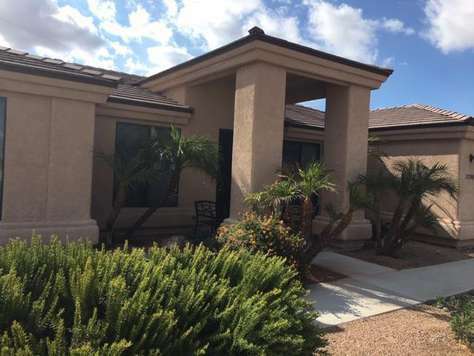 AZ taxes will be applied to all rentals 29 days or less"
Roomy 3 bedroom, 2 bath split floorplan home with King, and 2 Queens TV in 3 rooms, Suddenlink Internet WiFi. Sleep 6people. Come, Stay and Play at Monterey ! Prices and Availability - subject to change. AZ TAxes will be applied to all rentals 29 days or less. Heated Pebble tech pool and spa, Great for Winter swimming. Large 3 bed with gourmet kitchen and big kitchen/dining area under turret style. 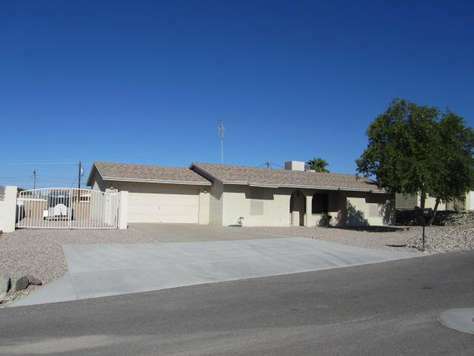 3 Car garage available for parking your vehichle, RV Garage is not open to renters. Pool and spa is on natural gas, heating it in winter & spring is $50 a day. 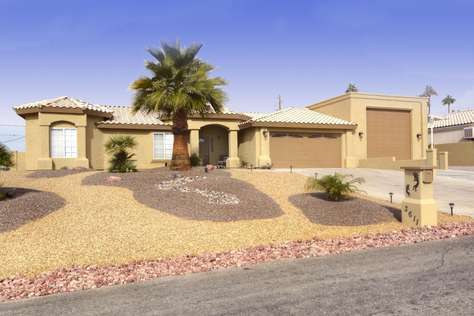 3 bedroom open living, big kitchen with large entertainment bar. Formal dining with views over the pool and beyond. Gracious Master suite with large soaking tub and walkin shower. 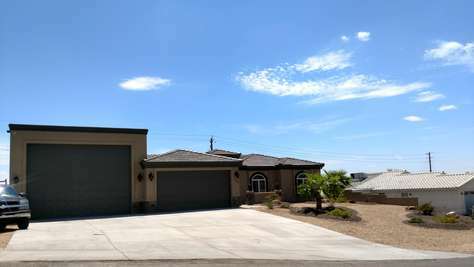 When you enter this home, the very open floor plan allows you to view the living room, dining room, kitchen and kids room along with a view of the pool/patio area. Lots of seating in the living room with a Smart TV for streaming or just cable TV watching. Hi Speed wireless internet is also provided. Brand new big Pool ! Beach Entry for Pool.Tile flooring throughout living area's. New flooring in Bedrooms. Granite countertops in kitchen. 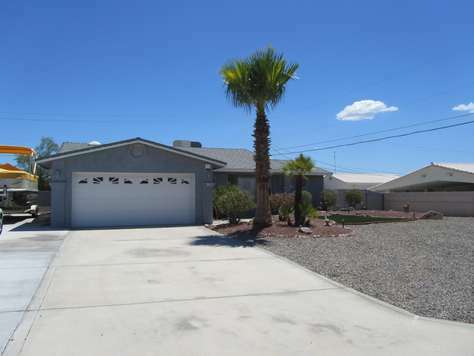 Great home for 2 couples or extended family. Room to park all the toys in this gated walled private yard. Bonus family room and large bedrooms. 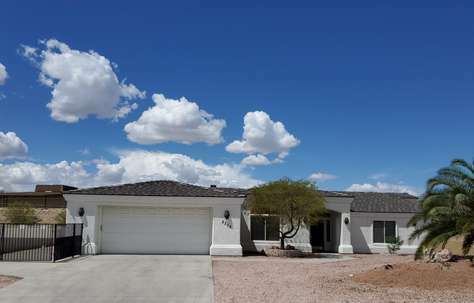 Located close to desert and lake! Comfortable split floor plan home with warm colors - overstuffed lounging by fireplace, inviting master suite. Bistro bar set up on patio for BBQ'ing comfort. 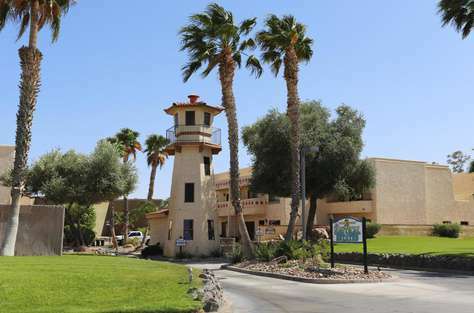 Come, stay and play at Palo Verde No. 935 Genoa Dr .Nautical Estates" On The Island"
This newer home is a shinning star! You'll love it, Very comfortable, warm and relaxing! Master bathroom with spa tub and shower, Hugh vanity double sinks and large walk-in closet. Kitchen has plenty of counter space with a breakfast bar and a cozy eating area . Guest bedrooms one king bed and one queen bed for your extra company. You'll Love this Winter rental! 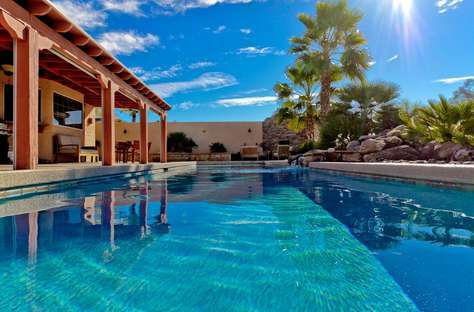 Sunset's diagonally over this home making for great swimming and lounging all day long - any time of year. Sit waist deep on the Baja shelf with umbrella for shade or at the Spa side shelf. Either area will refresh and rejuvenate you. 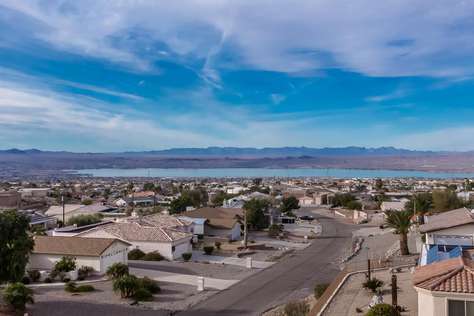 Located in Residential Estates area of southwest Havasu - very close to new Havasu Marina and Launch. 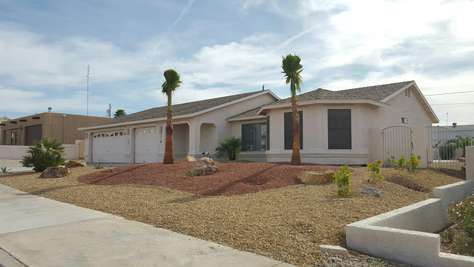 Beautifully updated, split floor plan. Until confirmed, prices & availability are subject to change. 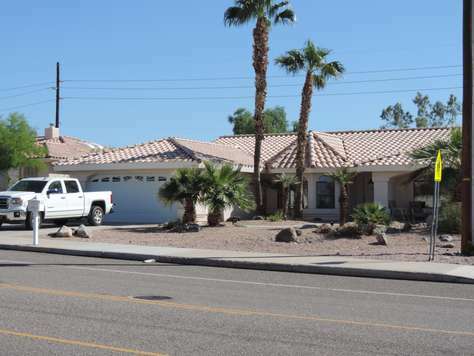 AZ tax is applied to rental 29 days or less. Nice open kitchen with large dining area. 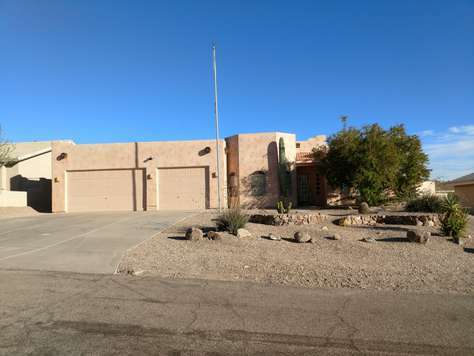 This home backs to a wash and sits close to the foothills. 55" TV in master bedroom. Darling hand made arched doors to bath with big soaking tub! Until confirmed, prices & availability are subject to change. AZ tax is applied to rentals 29 days or less. Its all about the space and comfort in this newly refreshed and decorated pet friendly pool home. Private backyard with BBQ, waterfall and large pool. Shaded patio offers more time outside then in. Side parking area is 18' x 53' so bring on the toys - you've got the space. (4) Smart TV's with ROKU and a Foosball table in game room. 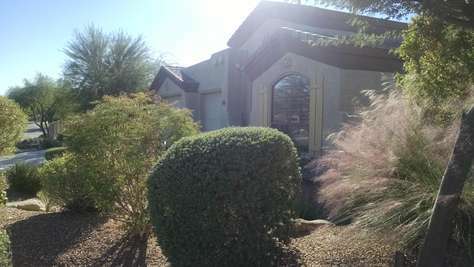 Beautifully updated Town home in gated community on the Island. Lovely 16" tile, new carpet and appliances. Granite counters in big open kitchen. Boat Marina is directly across the street for easy launching or mooring. 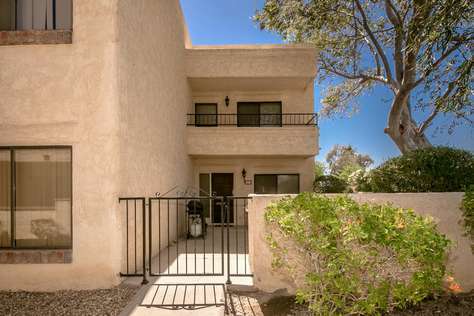 2 car attached garage and rare parking in front of unit. Get your front row view for Balloon fest and fireworks. Located on the Island surrounded by our lovely lake. Lovely two bedroom three bath home with boat deep garage. The custom eat-in kitchen features a u-shaped counter design with a large island for easy meal prep/entertaining and a dining table for six with room to spare. Comfy living room with vaulted ceilings, plantation shutters, and double french doors to the outdoor entertainment areas. The master bedroom overlooks the pool/spa and has its own french door for patio access. Master bath features a grand soaking tub, large walk in shower, private water closet, and a walk in closet. The HUGE guest room boasts two queen beds, two double mirrored closets, and bench seating at the foot of each bed. The patio is made for entertaining and fun featuring a heated pool with cascading spa, BBQ, multiple sitting areas, daybed, and much more. Both guest bathrooms have walk in showers and one features dual access, direct from the patio and into the laundry room. Perfect for before or after pool use as well as wet towels/suits straight to the laundry. One boat space and one car space available inside garage as well as lots of paved, secured side parking. Dog friendly home with owner approval but due to allergies, cats will have to vacation elsewhere. Currently only accepting monthly or more bookings. Home recently purchased by owners for their own family getaways. EVERYTHING inside and out is brand new and set up for families. Charming farmhouse decor with nothing left undone, "its the little details that matter" shines throughout the 3 bedroom two bath home. Full RV hookup available for your traveling friends. 1 car garage space is open for guest use with lots of extra secured side parking for all your toys. Pets allowed with owner approval. Book now before rates increase after completion of construction. 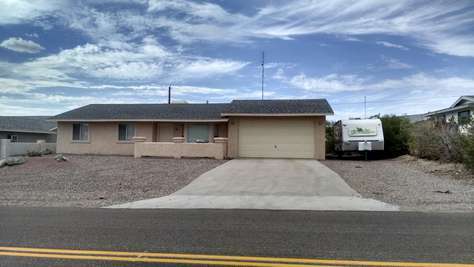 Charming three bedroom two bath centrally located home. Brand new 70" big screen TV in family room. Master suite features a king size bed, sliding door to pool deck, big screen TV, and a custom tiled walk-in shower. Upgraded linens for all three bedrooms. 1 car garage space with epoxy floors and a Foosball table. Side parking for your boat or ATVs. Dogs allowed with owner approval but cats will have to vacation elsewhere.